The Pecos model has a unique Arizona new home build feature. I haven't run across this feature yet in any other home. 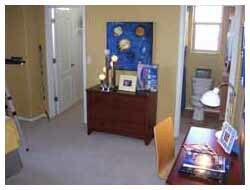 There are two large walk in closets in the master bedroom, a his and hers closet. But before I get too far ahead of myself you may want to open the interactive floor plan in a new window so that you can visualize the layout better. 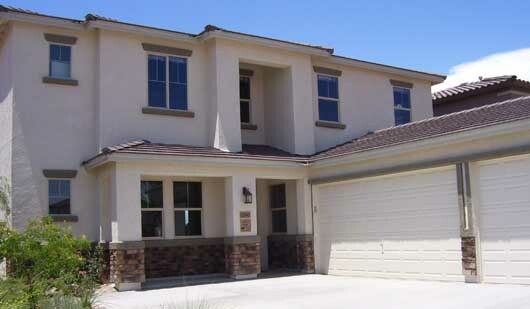 The Pecos is two-story and can either be 4 or 5 bedrooms. 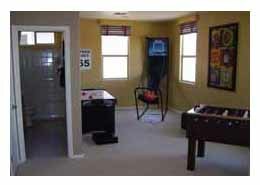 You can add a den instead of the living room, and if you choose the 5th bedroom you won't have the game room upstairs. There are 3 1/2 baths. The home is 2,991 square feet and currently starts at $411,000. 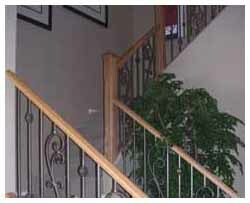 As you enter the home, the entry way is very similar to the Tierra model. The dining room is to your right. It is a little larger than the Tierra. You could probably extend the table to a larger size and fit 8 when you have company over. The table shown here has 8 seats, but your guests better really like each other or have very small legs to fit eight at this table. You really need more space to effectively use this as a space to entertain a group. I don't like that you must walk through the pantry and take a left to enter the kitchen. Even stranger is that you can take a right out of the pantry to enter the laundry room. There is a sliding door to close off the food from the walkway, but it's a little odd. I'm not sure I like my food and my cleaning supplies separated by 4 inches of drywall. I'm sure you could organize things accordingly though. So the dining room was to the right when you enter the home, the living room or den is to your left, and right in front of you is this beautiful staircase. It draws your attention right when you enter the home. The wrought iron might be an upgrade, but in my opinion it is a necessity. Even if it is an additional expense, the look is so much nicer than drywall. It's definitely worth the upgrade. The next room in the house is the kitchen. The kitchen has the nook area which gives it a large open feel. They put this small island in the middle of the kitchen which is ok, but I think it feels like it doesn't fit in the kitchen. I think it needs to be a bit larger or just remove it. 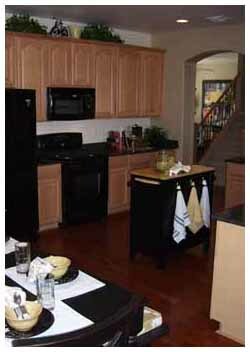 There is plenty of cupboard space and I like the look of the black appliances. I know stainless steel is the trend, but I'm not sure if I am on that band wagon yet. The hardwood floors are a nice touch. The builders are providing so many upgrades that hardwood floors should be a possibility for most people. You are able to exit from the nook on to the back patio. The patio is pretty small and there isn't an obvious way to expand it. Unless you purchased a large lot, you are going to be stuck with the small patio. The homes in this development use up most of the lot. If you don't like taking care of a backyard, then this is the right development for you. The backyards are tiny. I saw some that couldn't have been more than 12 feet from the home to the back wall. If you buy a home here I wouldn't plan on a pool unless you are prepared to use nearly the entire backyard for the pool. Moving back inside the home we are in the family room now. Most Peoria, Arizona new home builds have a pretty large family room and this model is no exception. The family room is a nice feature of this home. It is large, and the windows allow plenty of light into the home. Because it is right off the nook and kitchen there aren't any walls separating this room besides the counter top bar area. The kitchen, nook, and family room all feel like a large open space. Unlike the Tierra that had the master bedroom sharing a wall with the family room, there is a huge walk in closet that acts as a buffer zone between the master bedroom and the family room. This is the "his" part of the double master walk in closets I mentioned at the top of this page. I say it is the "his" master closet because it isn't near the bathroom. I'm going to make sure that I get the better closet area that is near the bathroom. 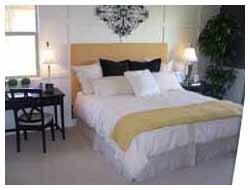 The best part about the master bedroom is that it is on the first floor. It is the only bedroom on the first floor and I can't explain how important this is. The home we live in right now has all of the bedrooms on the second floor. It's not terrible, but I am really sick of going up and down the stairs. I think it is nice to have the kids upstairs and your room downstairs. The size of the master bedroom is 13' x 16' 11" which is plenty big. It may feel a bit cramped with a California King bed, but otherwise it should be large enough. The master bathroom looks the same as the Tierra model. Alright we go upstairs now and at the top of the stairs you have this nice game room. You can see in the picture that there are a few game tables in here. Personally I like a pool table. If you spend a little money you can get a nice looking piece of furniture so that even if you don't use it that often at least it looks nice. The only other things you have upstairs are a couple bathrooms and the bedrooms. The bedrooms are a little larger than most Arizona new home builds. The rooms are basically 11' x 11', one is a bit smaller, one is a bit larger. You can tell from the picture that there is plenty of space. One feature you can change is that if you don't want the game room up here you can convert it into a fifth bedroom with a walk in closet. I don't think too many people need a fifth bedroom, but if you do it is available. Great Arizona New Home Build? It's hard to say. There are some features I love about this home, the master bedroom downstairs, the double walk in closets, the 3-car garage, the large loft/game room upstairs, and the house is absolutely gorgeous. There are all wonderful features. On the other hand we have the weird location of the pantry and the almost non existent back yards. For some people I am sure that is a plus and this house would work fine for them. I just think that in my point in life the design isn't optimal for me. Interested in Viewing this Arizona New Home Build? Of course if you are interested in viewing this Arizona new home build, or any other Peoria, AZ real estate I hope you give me the opportunity to work with you. 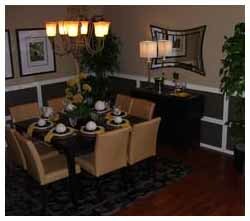 Please visit our "ABOUT US" and "WHY HIRE US" sections before you go view these homes. If you feel I will be a good fit to work with you then please Contact Me Directly and I will get back to you to set up an appointment as soon as I can. 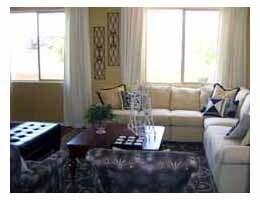 Or you could return to our Peoria Arizona New Homes Section to view other Arizona New Home Builds. Thank you for visiting my site and I hope to hear from you soon.